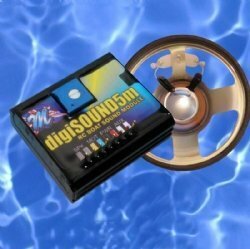 The digiSOUND5m is the new marine sound module from Mtroniks Ltd. It is the worlds first 100% waterproof, plug n play sound module designed to take the hassle out of giving your model a realistic sound! The sound module requires NO programming or set up, it comes with a realistic sound pre-installed leaving just the installation to complete before you can get under way! The unit comes complete with built in amplifier, wiring loom and even a 75.0mm diameter waterproof speaker! You simply install the unit in your model and go! There is no complicated PC interface to deal with or complicated set up, you REALLY do just have to plug it in and go!!! Add this to the legendary Mtroniks waterproof construction and you really dont need to look any further!